bore tide rush past at 15 MPH from Bird Point . 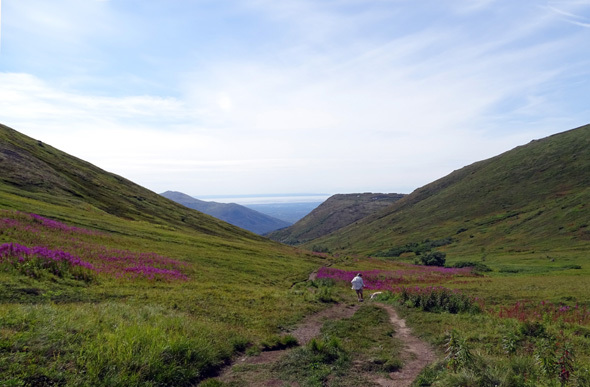 . ."
A couple weeks ago when I was hiking on Twin and Pepper Peaks in the northern section of Chugach State Park I found a slope full of blueberries and kept it a "secret" from other hikers with buckets who were out for a day of berry-picking. I picked only a few berries myself, thinking that it wasn't fair to take a bunch when the poor bears and birds needed them as they gorge themselves to make it through the long, cold winter just ahead. 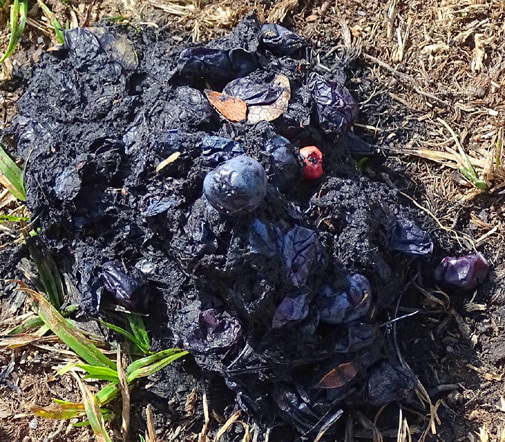 Bear poop (!!) 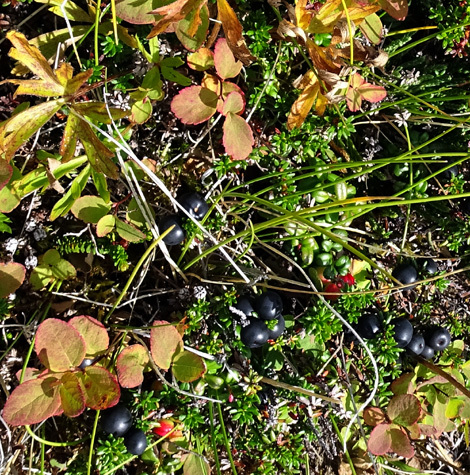 on today's hike -- full of blue and red berries; don't they digest them? Well, since then I've come to realize that there are plenty of blueberries and other kinds of berries that wildlife can access more easily than we humans can. 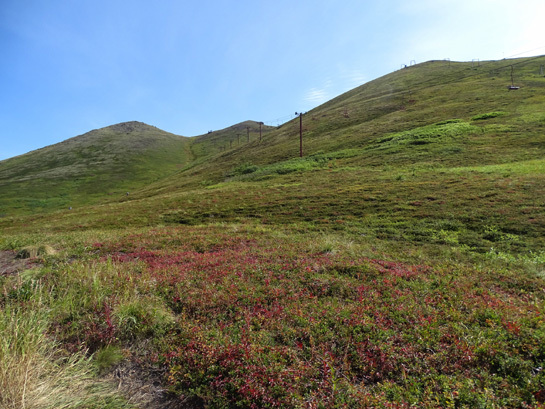 Berry picking in late summer/early fall is a long Alaskan tradition and I shouldn't be messing with it! Besides, it's fun, as we discovered today. Even the dogs got into it; Casey-pup is very good at sniffing out raspberries and blueberries and Cody readily scarfs down any berries we offer to him. 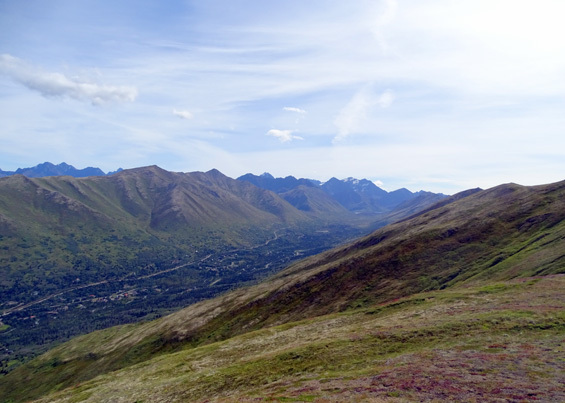 Today was beautifully sunny and warm again (70 F. for the high in Anchorage), perfect for a hike. Before lunch we drove up nearby Arctic Valley Road to the ski center where there is a trailhead I've used many times to hike up to Rendezvous Ridge. 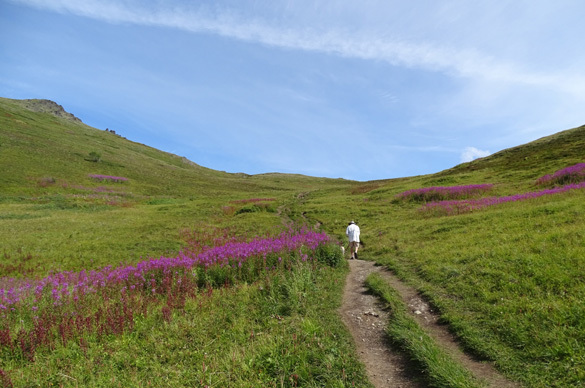 Jim's gone up to the trailhead to begin a bike ride from there to our campground at JBER but he's never hiked on the trail. 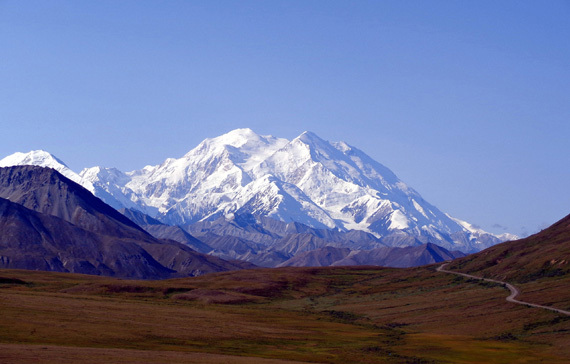 I love it up there because I can wander all over Gordon Lyon, Rendezvous, and Little Teton peaks and the scenic ridge extending south. 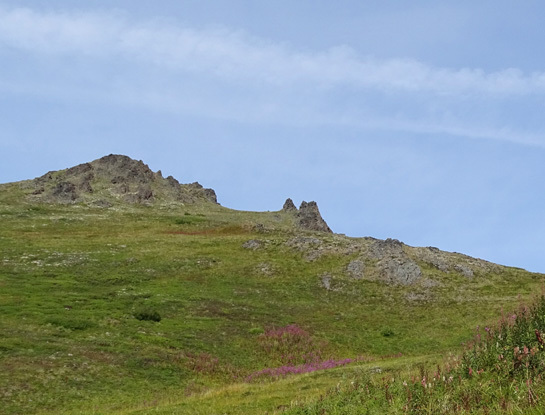 Since it's all above tree line it's easy to find my way around. 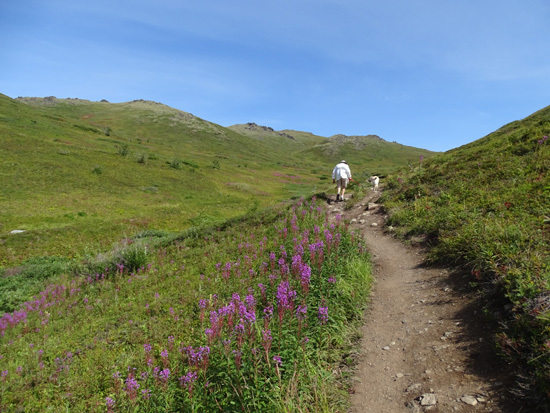 I planned to take Cody with me today to just go up 1.5 miles to the saddle above the south branch of the Eagle River and maybe hunt for blueberries. Little did I know that this is a very popular place for families to pick blueberries. I was surprised when Jim said he'd like to go, too, so all four of us went. 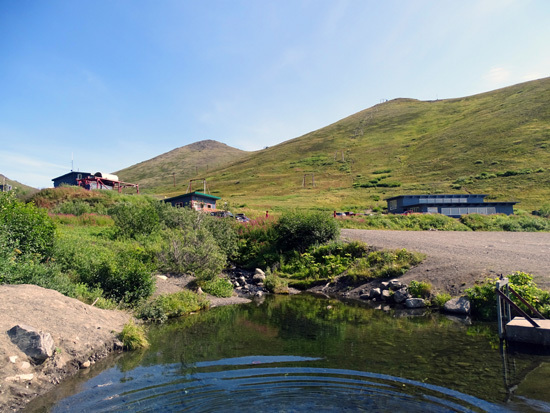 The lower part of Arctic Valley Road runs through military lands. This is the first time in about eight trips up and down the road that I've seen any military activity going on. About a mile into the gravel section we were stopped by a Humvee blocking the road just past a pull-off. We were told that troops were training and it'd be about 40 minutes before we could proceed. About five other vehicles were already parked in the pull-off and a dozen more arrived before we were all allowed to go on up. 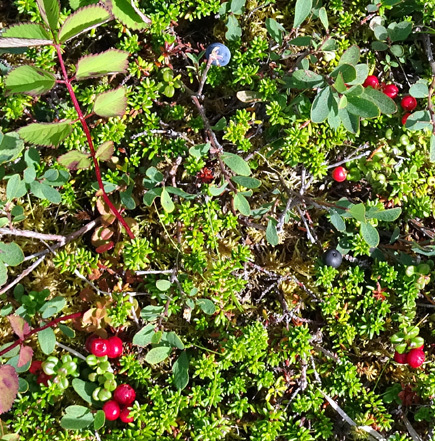 Leaves on some of the blueberry bushes are turning red already. One of the military guys came over to our truck to ask if we were attending the wedding wedding??) or going blueberry picking. Only two options? We replied that we were going hiking. He just wanted to tell us not to stop anywhere along the road the next few miles, until we passed another Humvee. Because of all the dust we let most of the other vehicles go on ahead of us. 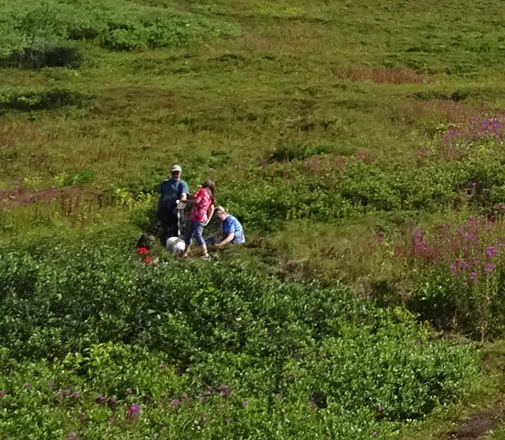 Those folks were in a hurry to get to either the wedding or picking blueberries. The parking lot is large so we didn't worry about finding a space. We let the dogs swim in the pool of creek water near the parking area (above), then started hiking up the main trail. 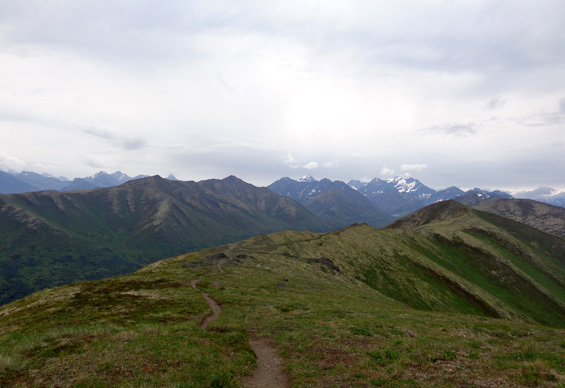 Hardly anyone was just hiking, so we had the trail mostly to ourselves. 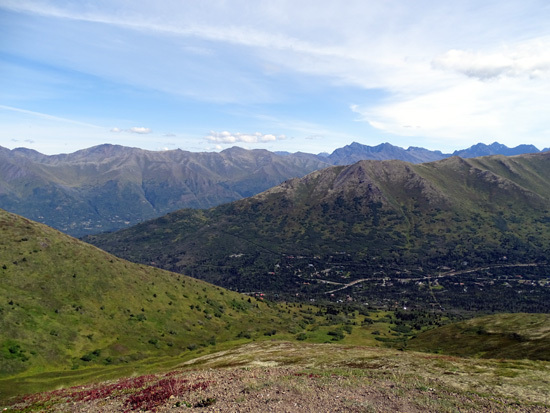 We decided to hike up the trail to the saddle first, so Jim could see down to the Eagle River valley, then look for blueberries on the way back down the mountain. That way we wouldn't have to carry the fragile berries for so long (we just had small plastic bags, not buckets). 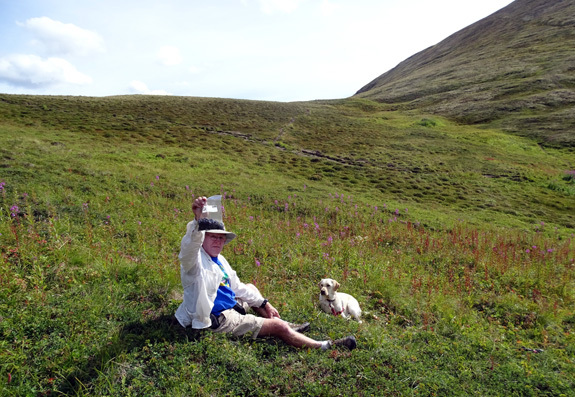 This was Jim's first time on the trail, which is much more moderate than the one up to the Harding Icefield that he hiked with me last week in the Seward area. 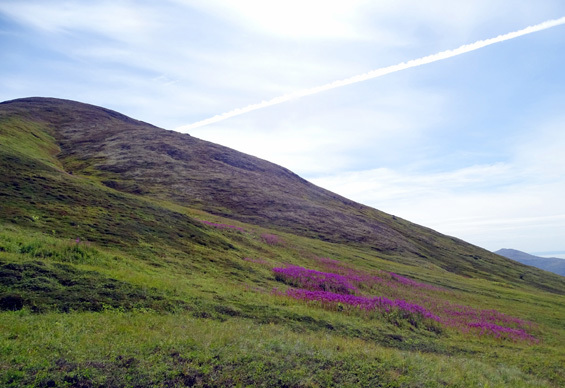 We spent a few minutes at the saddle, then began looking for plump, ripe blueberries. 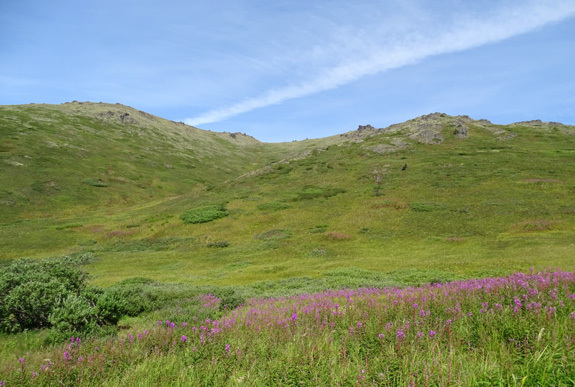 The first berries we saw near the saddle and on north-facing slopes were tiny, navy-colored, hard, and sour -- definitely not ripe. Casey didn't care. She was ON them, stripping the tiny branches clean. She ate more than she should have during the time we were up there. We expected her to have some stomach distress and/or runny poop in several hours. That didn't happen, fortunately. Jim holds up his bag of blueberries. 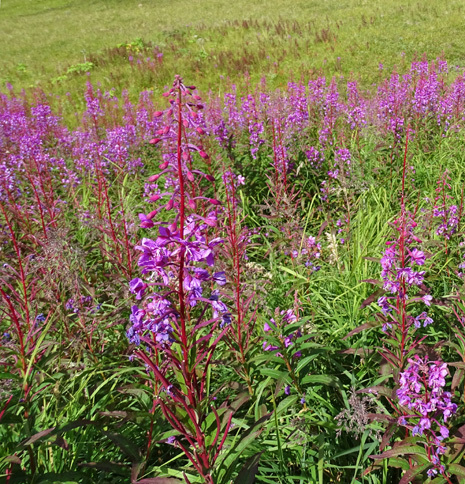 I wandered around picking ripe berries nearby. Cody was off-leash the whole time, showing great interest in what I was doing and wanting more berries than I gave him. He never did try to get any himself and I don't want to teach him how to do it! One canine berry-picker in this family is enough. 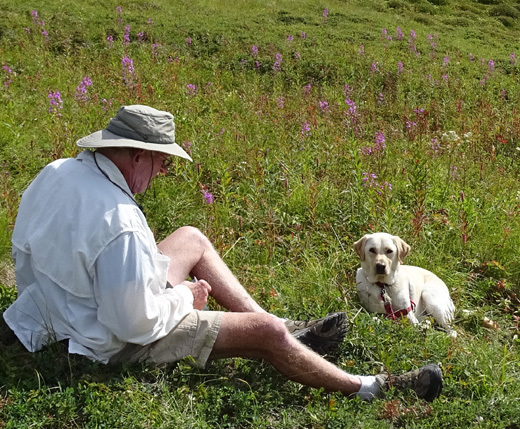 Several other folks had dogs with them, too, mostly off-leash. We let Casey play with a couple of them. She was just as interested in getting attention from their people, however, so she had to stay on-leash most of the time. 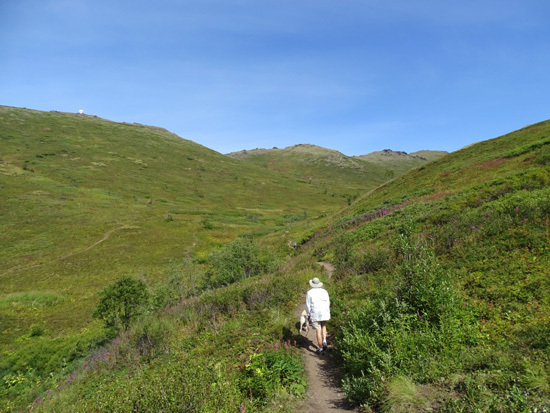 We got a total of three miles hiking, lots of sunshine and fresh, cool air, and had fun picking berries. They are much smaller than the ones I get at stores, however, and not as tasty. It took me a while to cull the best ones out after washing them. Once was enough for Jim. 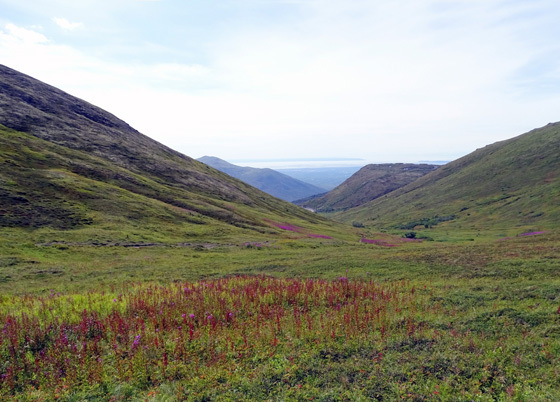 Although I continued to pick and eat some berries while hiking during the remaining time we were in the Anchorage area, I didn't take any more home with me.